Following a record EU penalty, Google had to revamp its Shopping service and create more competition. Now, 32 percent of ads come from external Comparison Shopping Services (CSS). However, traditional product and price comparison portals only provide 9 per cent of the total ads. With marketing agencies occupying 23 per cent of the market, this calls into question the kind of competition that exists for ads appearing within Google Shopping. 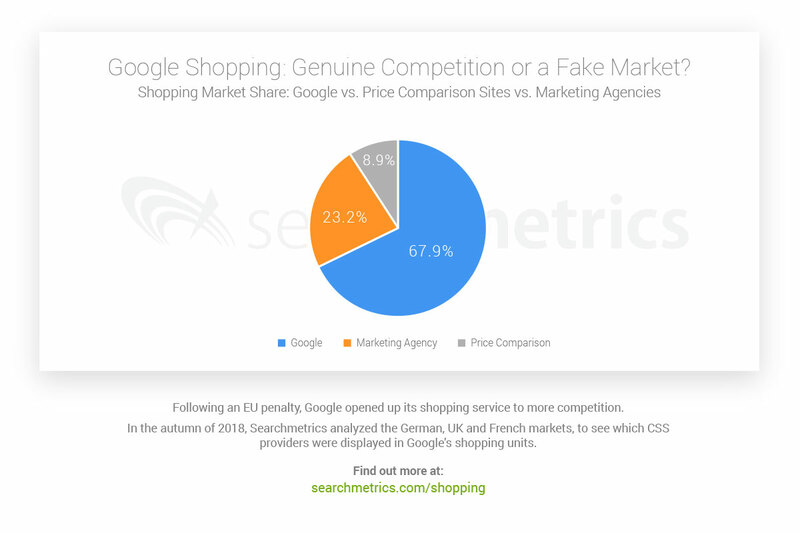 San Mateo, December 05, 2018 ‒ Over a year on from the European Commission’s antitrust ruling which forced Google to open up its shopping service to outside competitors, new Searchmetrics research suggests a third of ads within Google Shopping boxes are coming from providers other than Google. But the majority of these (23% of all ads) seem to be from digital marketing agencies profiting from Google Shopping’s revamped auction model. Only around 9% are from the traditional comparison shopping sites (CSSs) that the EU’s ruling was originally intended to support. In an open letter to the EU’s competition commissioner, 14 European shopping comparison services recently claimed that the modifications Google has made to make its shopping service fairer have actually made matters worse for them. 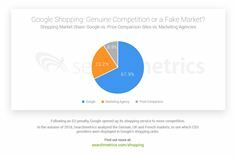 They claim Google is now trying to populate the service with ‘fake’ comparison shopping sites by ‘reaching out to Google Shopping Ad Agencies to encourage and incentivize them to pose as CSSs’. Searchmetrics’ analysis of Google Shopping in the UK, Germany and France, has found that many non-Google ads are coming from numerous new players, mainly digital marketing and advertising agencies, whose role is to manage the ad auction process for merchants. While these firms do run comparison shopping websites, their pages tend only to list the products sold by the merchants whose bids they manage – which means they are otherwise largely irrelevant for genuine comparison shopping. The agencies are likely to have been encouraged to enter the market by the Google Comparison Partners program which creates certified CSSs who can act on behalf of merchants that want to bid for Google Shopping ad slots. Its SpendMatch incentive scheme has been giving merchants rebates of up to 30 percent of their shopping budget if they place their shopping ads via an external Google-certified CSS and not through Google itself. In effect, Google has been giving cashback if merchants spend their ad budget via these competitors. While SpendMatch has been available for ads from all CSS’s, including the traditional price comparison websites, it appears that these true comparison services have found it difficult or unprofitable, since it is not part of their business model to attract merchants to place their ad bids. In the letter to EU’s Competition Commissioner, the comparison services state: ‘few rivals have chosen to participate in Google’s CSS auction’. Searchmetrics analyzed Google search results for approximately 500,000 keywords per country in the UK, France and Germany, noting how frequently rival comparison services appeared in the Shopping Units in Google desktop searches. Data was collected at four points in September and October 2018. According to the study, Twenga is the only classic comparison site among the top three external advertisers on Google Shopping in any of Germany, UK or France. And in the UK, for instance, the online marketing agency periscopix.co.uk − with 20% of external ads − is the best represented competitor in Google Shopping. Six of the top 10 competitors in the UK are very new – their sites only started being listed in Google’s paid or organic search results in 2018 – and they are all marketing agencies rather than established comparison sites.